Get the perfect plate for your brand new ride on car! Nothing says special like having your son or daughter’s name on their own car. 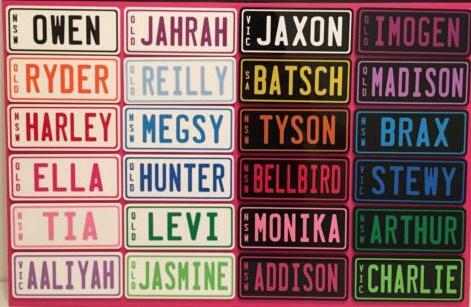 At Kidz Auto, you can purchase high-quality PERSONALISED license plate for our ride on cars. Our plates are 12cm x 5cm and are made of 3mm thick acrylic which makes them very durable, and the rounded corners make them safe for kids. Plus, they are 100% waterproof. You can customise your plate with whatever text you want (up to 8 characters at a squeeze) and lots of different text colours! Order your PERSONALISED plate for your little rider today. Once ordered, we’ll get in touch to get your exact specifications. Note: Plates are shipped separately from the car as they are custom built.